How can a narcissistic billionaire who is running a racist election campaign claim to speak for disgruntled workers? Why is it that the first woman ever nominated for president by either of the two big capitalist parties is more hawkish on foreign policy than her Republican opponent? What does the current, seemingly bizarre election struggle tell us about where politics is headed in the United States? History never repeats itself exactly, but knowing what the real issues and the real forces have been in earlier presidential elections can help us see through the illusions, demagogy and media hype of this one. Fortunately, there’s a great book available that offers such a lesson on U.S. history: “Market Elections — How Democracy Serves the Rich,” by Vince Copeland. Yes, elections are bought and sold — for increasingly astronomical sums of money that make it virtually impossible for true representatives of the multinational working class, the vast majority of the people, to get elected to national office. But that’s not the whole story. There’s a long history behind the evolution of the Democratic and Republican parties, and many struggles between them that at one time involved the increasing incompatibility of two different forms of class oppression. In the great Civil War between these two systems, the Republican Party leaders around President Abraham Lincoln finally came around to the position that chattel slavery had to be abolished, a position that the enslaved peoples and the Abolitionist movement had heroically fought for. Today it is the Republican Party that makes an appeal to racism and xenophobia, while the Democrats are relying on the votes of Black and other oppressed peoples to defeat Donald Trump. But the great betrayal of 1877, in which both parties conspired, has left its terrible legacy. All over this country, regardless of which party holds local office, the oppression of Black and Brown people is so endemic, so hideous, that another national uprising against racism, particularly the brutality of the police and other representatives of the state, is now underway. Oppressed people and their progressive allies are not waiting for the outcome of this election; they are in the streets. As Copeland explains, the triumph of big capital in the Civil War enabled the tempestuous growth of industry in the succeeding decades. Each presidential election became a contest between different factions of industrialists allied with different banks. Sounds like today, doesn’t it? How much has been spent by the ruling class since then to demonize as “subversive” this honest assessment of the U.S. government? But an understanding of the true nature of our “democracy” is once again animating mass movements, especially of the young. 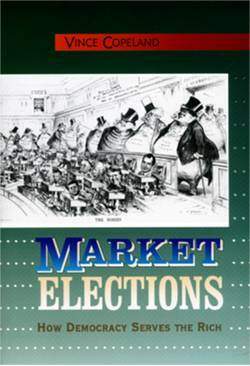 There is far too much in “Market Elections” to even summarize the book in this brief review. What Copeland shows is the intersection of electoral politics with the struggles of the workers, the poor farmers, and the oppressed nations, and how that shaped the history of this country. But he leaves plenty of room for exploring the vagaries of the candidates themselves — both appalling and ridiculous. It’s a welcome antidote to the fawning respect for presidents we are taught in school to know, for example, that even the superrich considered politicians to be “slobs,” in Alice Roosevelt Longworth’s famous assessment of Warren G. Harding, who won the 1920 presidential election. Her patrician family had supported James Cox, whose running mate was Franklin Delano Roosevelt. Harding was a creature of the competing Mellons and Rockefellers. Had Harding been a Roosevelt creature, her view of him might have been the same, but unspoken. “Market Elections” is an invaluable reference for those seeking to understand the complexities of how the ruling class has been able to use the “democratic process” to stay in power for more than two centuries — and how mass movements can break through the two-party straightjacket to bring about real change. Copeland’s book was first published in 2000 and has not yet been converted into an ebook. 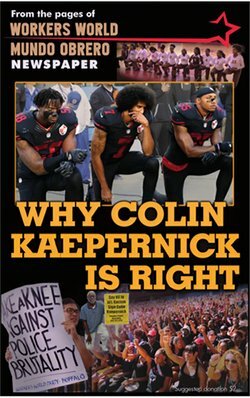 The paperback (296 pages) can be ordered from online booksellers or directly from World View Forum at 147 West 24th St., 2nd floor, New York, NY 10011 at a discounted price of $15, which includes shipping.